are ideally balanced, just as with other Verity models," and the midrange "strongly hints at the midrange qualities of its bigger brothers." But even with a "'grippy,' tight-as-J.Los-jeans solid-state amplifier in charge," the bass was "a touch fat -- a little loose." Features "The Verity Audio earmarks are unmistakable: an elegant, tapered cabinet with a beautiful finish, front-mounted tweeter and woofer, and a rear-firing woofer." "Verity calls the Tamino X3 a two-and-a-half-way design, meaning that the midrange and woofer drivers overlap in terms of response." as far away from the walls as possible." Value "A relatively cost-effective gateway to Veritys sonic world." Regular SoundStage! readers have seen Verity Audios Tamino X3 loudspeakers listed on our upcoming-reviews list longer than any product in our publications history. There are a couple of reasons for this. Part of the problem was myself, or more accurately my situation. I review more loudspeakers than anyone else here at SoundStage! -- and perhaps more speakers from year to year than any audio writer. As a result, my home tends to look more like an overstocked audio shop than a place where someone lives. Products, mainly speakers, are everywhere, and I have to write about every single one of them. That long list of products is called the review queue, and sometimes the queue takes a long time to work through, or get rid of, as speakers have a way of hanging around longer than electronics. The other reason for the delay had to do with Tamino X3s themselves. In a nutshell, I had to work with them a little more than with other speakers Ive had in for review, something Ill explain in-depth below. Suffice it to say, then, that this one-two combination resulted in a product review that took a lot longer to come to life than I first expected. But on the bright side, I have a lot more experience with the Tamino X3s than someone who just hooks them up once and gives them a quick listen. One look at the Tamino X3 and the Verity Audio earmarks are unmistakable: an elegant, tapered cabinet with a beautiful finish, front-mounted tweeter and woofer, and a rear-firing woofer. A similar look and configuration can be found on the companys Fidelio, Parsifal, newly introduced Sarastro, and top-of-the-line Lohengrin speakers. Julien Pelchat and Bruno Bouchard, Veritys owners, told me that they design their speakers to sound and look good, and they've obviously found formulas they like for both. Verity has an undeniably cohesive design philosophy. Whats different about the Tamino X3 compared to the other Verity models is the price. The Fidelio and Parsifal, both now upgraded to Encore status, will set you back $11,995 and $16,995 USD per pair respectively. The new Sarastro is $30,000 per pair, and the Lohengrin is $60,000, double the price of Sarastros and ten-times that of the Tamino X3s, which cost $5995 a pair. In comparison, the Tamino X3s' cost seems like hardly anything at all, and the speaker becomes more or less a relatively cost-effective gateway to Veritys sonic world. Verity speakers have a graceful and elegant appearance that in many cases will add to the appearance of a listening or living room -- quite the opposite of the muscular, mechanical, and robotic appearance of many speakers whose looks only its owners, usually male, could love. The piano-black finish on the review pair of Tamino X3s is gorgeous -- the best finish Ive seen at the speakers' price -- and the Tamino X3 has the elegant cone footers, magnetically attached grille, and custom-made binding posts that also adorn the more expensive Verity models. Verity has also shown the Tamino X3 with a snappy silver finish. But as much as you do get with the Tamino X3, you dont get everything, nor should you for less than half the price of the next model up. The Tamino's 9 1/4"W x 12 1/2"D x 35"H cabinet is one piece, as opposed to the separate bass and midrange/tweeter enclosures that Veritys higher-priced speakers have. And the Taminos cabinet is not as substantial as those of the pricier models. In other words, those other speakers are heavier and their cabinets seem more dead when you rap on them. Still, the Tamino X3 can still be considered well built, and each speaker clocks in at about 50 pounds. While the Tamino X3s tweeter is the same as that used in the Fidelio Encore (a 3/4" ScanSpeak soft-dome unit), the midrange and woofer are not -- and this difference, I believe, is quite substantial. One hallmark of the Fidelio and Parsifal is the 5" Audiotechnology midrange driver. It sounds lightning-fast and appears to be what gives each of those speakers their great transparency through the midband. Verity implements that driver in its pricier models with no electrical crossover between tweeter and midrange -- the midrange rolls off mechanically and blends with the tweeter. On the other hand, the Tamino X3s midrange is a 6 1/2" "Symmetrical Drive TPX Cone" implemented with an electrical crossover on the top end, while the rear-firing woofer is a 6 1/2" polypropylene unit. Both drivers are sourced from SEAS. Verity calls the Tamino X3 a two-and-a-half-way design, meaning that the midrange and woofer drivers overlap in terms of response. But this only tells part of the story. The Tamino X3 is "parallel coupled" (Verity's term), meaning that the front-firing midrange-woofer operates with no cutoff down low, so the driver goes as low as it naturally extends. The rear-firing woofer, however, only produces frequencies 100Hz and lower. Verity rates the sensitivity of the Tamino X3 as 89dB/W/m and the nominal impedance as 6 ohms. They do, however, indicate a 4-ohm low point in the impedance, and this, I believe, did cause problems with some of the amplifiers I tried to use with the Tamino X3s -- and was one of the issues that caused me to take such a long time reviewing these speakers. For the bulk of my listening I used the Simaudio Nova CD player, and cabling was Nordost Valkyrja. The best sound from the Tamino X3s came when I powered them with the Perreaux 200iP, Arcam FMJ A32, Simaudio Moon i-3 integrated amplifiers, as well as the Orpheus Laboratories Two/Three S preamplifier/power-amplifier combo. The common denominator with all these amplifiers is that theyre solid state and capable of driving low-impedance loads easily -- critical with the Tamino X3s. In case youre wondering, I dont recommend even dreaming of using this speaker with low-powered tubes. It took me literally months to figure out what the Tamino X3s sounded like, mostly due to the amplifiers with which I was using the speakers. For example, I first tried the speakers with my Blue Circle BC2 monoblocks -- hybrid single-ended designs -- and the sound was merely OK. Had I just used those amps and called it a day, this review would have been less than glowing. But I could also tell that the amps were straining, and speaker performance cant be accurately gauged if the amps aren't driving the speakers properly. The symptoms of the BC2s straining are a distant sound and little increase in SPL even when the volume knob is cranked. And even though Blue Circles newer hybrid BC24 stereo amp is more powerful than the BC2 monos, it too sounded slow when connected to the Tamino X3s. In both of these cases the highs sounded strained, the midrange was too relaxed, and the bass was way too fat and lacking in depth. It wasnt until I used the Tamino X3s with the 200Wpc Perreaux 200iP solid-state integrated amplifier -- and subsequently the Arcam, Simaudio, and Orpheus Laboratories products that I mentioned above -- that I really knew what the Tamino X3s were capable of. With those amps in charge the Tamino X3s snapped to life, and the differences were far from subtle. A word of caution: Dont demo the Tamino X3s with the wrong amplifier. Once the speakers were powered properly, the highs were cleaned up, the midrange became more prominent (but was still a touch relaxed), and the bass was so full that I suddenly had speaker-placement issues to contend with. In fact, I spent two days moving the Tamino X3s around to get the right low-end response in my room. For small-to-medium-sized rooms the Tamino X3s can be overpowering if youre not careful about placement; I recommend getting them as far away from the walls as possible. With proper positioning and amplification worked out, I was in a much better position to judge the Tamino X3s. Contrary to my initial impressions, the real Tamino X3 is a very full-sounding speaker with a refined top end and a midrange that is more soothing than forceful. I remember listening to Willie Nelsons 2002 CD release The Great Divide [Universal 586231] when I was powering the Tamino X3s with the Perreaux 200iP. Willies voice had a good sense of presence, the stage was well spread out, there was a real sense of depth, and the bass was full and powerful. The sound was certainly good, but what struck me most was that the Tamino X3 sounded a fair bit different from a good number of speakers Ive listened to, and Im not just talking about the extended bass, although that was certainly part of it. The Tamino X3 goes significantly deeper than all the minimonitors Ive reviewed -- and so it should with its dedicated rear-firing woofer and larger cabinet. But even with a "grippy," tight-as-J.Los-jeans solid-state amplifier in charge, I found that the bass from the Tamino X3s was still a touch fat -- a little loose. If I recall correctly, the Fidelios I reviewed had a similar quality -- these are both room-swelling speakers; however, I do remember that the Fidelios, with their 7" ScanSpeak woofer, were as punchy as they were robust. Now this isnt necessarily a bad thing. The Tamino X3 has a very full sound and ample weight down low, and it can sound quite rich and vibrant with certain types of music. On the choral-based soundtrack to the movie The Mission [EMI 811267], for example, the Tamino X3 could really charge the room with a foundation of low-frequency heft. But as I said, youre going to have to be careful with placement so you dont get too much heft. On the other hand, with music that relies on visceral impact -- the Latin-flavored Buena Vista Social Club Presents: Omara Portuondo [Elektra/Asylum 79603] comes to mind -- the Tamino X3s can still come off as a little slow and loose down low. The highs, though, are ideally balanced, just as with other Verity models Ive heard. The treble is not too relaxed and certainly not forward at all. The Tamino X3s dont have any of the boom and sizzle that you can find in some supposed high-end designs. The midrange is a tad relaxed, but not all that different from what I've heard from other Verity designs. Voices dont project from the Tamino X3s as they do from some other speakers, where voices and instruments that occupy the midrange region sound as if theyre being propelled from the drivers. In the case of those latter, more-up-front speakers, I suspect the midrange is goosed a little, whereas with the Tamino X3s I believe it to be just a little laid-back. As a result, the Tamino X3s have a somewhat distant quality -- not obscured, but rather back from the stage some. Not surprisingly, then, the Tamino X3s, like the other Verity speakers, can lay out a well-defined soundstage that has a very good illusion of depth -- something common with speakers that are voiced to have a more laid-back sound. As I wrote about Willie Nelsons voice, the sound had good presence, but it certainly wasnt thrust at me. When it came to The Mission, the Tamino X3s had no trouble creating room-filling sound with all their low-frequency weight, and the collage of voices was rendered with notable depth. I know that a good number of readers will wonder if, in fact, that Tamino X3s can match the Fidelios or Parsifals when it comes to those speakers' midrange magic. This is the defining trait of the Fidelio and Parsifal: a subjective sense of transparency and beauty in the midrange that some compare to the sound of electrostatic speakers. Its a see-through-ness that is impressive. Ill start by saying that its been years since the Fidelio has occupied space in my listening room; however, I have listened to Veritys designs at many shows and they almost always sound similar in each room, and similar to what they sounded like in my room. Based on my memory and those show experiences, then, the Tamino X3 strongly hints at the midrange qualities of its bigger brothers -- and those speakers too have a bit of a laid-back quality in that region -- but doesnt seem to match their transparency or immediacy. I cant put a quantitative figure on it, but I can say that while the Fidelio and Parsifal have an element of midrange immediacy that is uncanny, the Tamino X3 doesnt distinguish itself in the same way, although the family resemblance is certainly there. 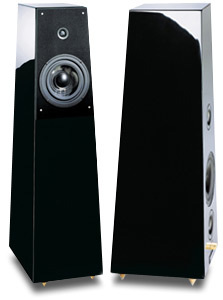 One of the hotshot speakers that came through my doorway in 2003 was the $2600-per-pair Focus Audio FS-688, a small two-way bookshelf speaker that will likely appeal to the same clientele as the Tamino X3. Both speakers feature cabinet construction and fine details that put them in the category of luxury goods. I really liked the heavily lacquered real-wood veneer of the FS-688, and I admired the attention to detail, including the way Focus Audio recessed the binding-post area of the FS-688. But as nicely done as the FS-688 is, I give the nod to the Tamino X3 in terms of overall presentation. The Tamino X3 is elegant -- a beautiful woman in a simple black dress. The Tamino X3s tall, slender, sloped cabinet complements a room. The speaker looks more like fine furniture than audio equipment. And then there are the little touches -- like the grille, which is magnetically attached, and the custom footers. If high-end audio had a best-dressed list, Veritys speakers would make it every time. When it comes to sound, however, the Tamino X3 and FS-688 are quite different, showing what you get for different sums of money and different speaker designs. The FS-688 obviously cant be called upon to generate the same kind of bass as a speaker with a dedicated woofer -- and it doesnt. The Tamino X3 is very close to being full-range, while the FS-688, for all it tries to do, cant come close. Then again, the FS-688 has a fraction of the cabinet size, one less driver, and not coincidentally it costs less than half as much. In fact, Focus Audio offers a floorstanding speaker purported to be close to full range, the FS-788, which is quite a bit closer in price to the Tamino X3. What the FS-688 helps to illustrate is simply what the world of minimonitors is about -- no low bass, but topnotch performance everywhere else at a fraction of the floorstanding-speaker price. And in that regard the FS-688 holds its own quite well against the Tamino X3. In one area it certainly outdoes it. The top end of the FS-688 is sweeter-sounding than that of the Tamino X3. The FS-688 sounds a tad more delicate and has purity that the Tamino X3 cant quite match. In fact, not a lot of speakers regardless of cost can match the FS-688 in this regard. But when you look at the tweeters that the FS-688 and Tamino X3 use, this shouldnt come as much of a surprise. Both are from ScanSpeak, but in the case of the FS-688, its the much-ballyhooed Revelator, the best tweeter ScanSpeak makes and quite a bit more expensive than that of the Fidelio. While price doesnt always correlate with performance in high-end audio, I suspect that with these two tweeters it does. The midrange becomes more of an apples-to-oranges comparison. Although the FS-688 is not necessarily an up-front speaker through the mids, I found that it sounds more forward than the laid-back Tamino X3. Voices through the FS-688, for example, are placed at the speaker plane, or maybe just a little in front depending how the musics mixed. The Tamino X3, on the other hand, always sounded a touch easier. Preferences in this regard will likely dictate which speaker a particular listener favors. Assessing the value of the Verity Audio Tamino X3 speakers is, by high-end-audio standards, a fairly complex affair. To me, there are a few things to consider. The first has to do with cosmetics. The Tamino X3 is beautifully built and looks stunning. Its a true luxury item thats a pleasure to display -- enough said. The point is that high-end speakers like the Tamino X3 are about more than wood, drivers, and electronic parts. The Tamino X3 is finished to a standard beyond the norm, and obviously part of the $6000 price tag goes to paying for that. Then there is performance, including the way the Tamino X3 compares to other speakers in its price range. Setting cosmetics aside, todays consumer has a wealth of options in the marketplace, and taste will dictate most which speaker is best to one listener or another. The Tamino X3 has some sonic traits certain listeners will like, including resemblance to pricier Verity Audio speakers, but other speakers will have their good points too. This leads me another performance aspect of the Tamino X3. Verity speakers have a sonic signature that makes them identifiable beyond their styling, and based on the companys longevity and success with their products, that signature must be a good thing. Do you want the Verity sound, that midrange magic displayed by the Fidelio and Parsifal? Many people do. Do you have the budget for it? If the answer to the first question is yes and the answer to the second is no, the Tamino X3 is your speaker, simple as that. While the Tamino X3 cant match the Fidelio or Parsifal in all aspects, its a cost-effective facsimile of what they deliver and is your ticket into Veritys world for a fraction of the bigger speakers prices. For many audiophiles, that will make the Tamino X3 a gateway product -- and a speaker worth seeking. We would like to thank Doug Schneider for his friendliness on the day we delivered the Tamino X3 and also congratulate SoundStage! for the impressive efficiency in covering major audio events. We are astonished every time. It is an important contribution in making the audio market a pleasant and informative industry, a foundation for a strong and viable market. Now, concerning Dougs review of the Tamino X3, we would like to add a few notes that we believe will help the readers further understand the Tamino X3. These are based on our own experience with the product. We hope that this additional information will help potential customers in making an advised buying decision. Based on Verity Audios product vocation, we address our loudspeakers to people who seek refinement and attention to detail in every aspect. In other words, the Tamino X3 is a pure Verity Audio product because it inherits the same finishing quality, cabinet construction, and proprietary components that you can find in our top-of-the-line loudspeakers. For the largest part of features, no compromises were made. The drivers are all sourced from the best Scandinavian manufacturers with whom we closely work to develop components that match our performance criteria. In order to offer our customers a selective choice that can address a variety of dedicated and specific needs, Verity Audio offers different Tamino models: the Tamino X3, the Tamino X2, the Tamino C2, and the Tamino Monitor. The Tamino X3 is designed for larger-than-average rooms. It can be very impressive in large rooms. Doug has well depicted this point in mentioning that the Tamino X3 is a very full-sounding loudspeaker that can overpower a small room. This is absolutely true. This characteristic is extremely appreciated for home-theater applications. The Tamino X2 ($4995 per pair) is designed to offer amazing low-frequency extension in small-to-medium-size rooms without overpowering the rooms. 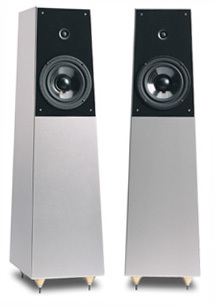 It is a ported floorstanding two-way version of the Tamino X3. Tamino C2 ($3000) is the center-channel version of the Tamino X2, and the Tamino Monitor ($3000 per pair) is a sealed two-way monitor that can be used on stands, attached to walls or placed in bookshelves. Due to the different models, the Tamino line is therefore a highly versatile line of loudspeakers that can adapt to any situation. Analyzing sonic performance is sometimes a bit tricky. We all have the impulse to dissect the aspects of performance into the bass, midrange and treble. Each has its own importance, but their respective qualities shouldnt be correlated to overall performance. It is difficult to do since speakers are conceived with discrete voices. Verity Audio puts extensive effort into designing loudspeakers that will synthesize sonic performance into a homogeneous whole. The key element is integration: How will the individual elements integrate together? This overall coherence is crucial in the process of getting excellent sonic performance. To integrate properly, every part of the range should be in perfect balance. For this reason, speaker placement and room characteristics are fundamental. And this is even more critical for loudspeakers that reach lower octaves. The bass performance will have a direct influence on the overall spectral response. In other words, the midrange and highs will be influenced. It would probably be a good exercise to experiment with the Tamino X2 and/or Monitor and see how much this is true. Regarding amplifiers, we have had great success mating with tube amplifiers as well as solid-state models. Even though they present a 4-ohm bass impedance, the Tamino X3s are designed to be used on 8-ohm taps. To resume, having a large room, solid-state amplifier, or 8-ohm taps on a good tube amplifier puts you in business to get a great sound from the Tamino X3. As a true Verity Audio loudspeaker, the Tamino X3 has been designed for hours of listening without fatigue.